Keep your big best friend at a healthy weight with this Eukanuba adult weight control large breed food. Big dogs have a big appetite, and that means it can often be hard for them to stay at a healthy weight. It can be hard to tell if your best friend is a little overweight, but if they seem to be a bit more lazy than usual, or you can't feel their ribs when you put your hands on their tummy, then they might be a bit large. 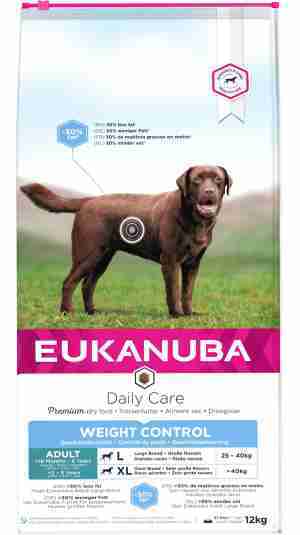 An easy way of helping them stay in shape is to feed them this Eukanuba adult weight control large breed food, as it has much lower fat content that normal dog food. It's also great for helping them to keep their teeth clean, and has been clinically proven to reduce tartar by up to 55% in a month. calcium boosts their bone and teeth strength. If your pooch is over 35kg in weight, then they're going to have a big appetite. That's perfectly healthy, but it can also be very easy for them to overeat. Because they're so big, it can sometimes be hard to spot if they're putting weight on too. This food has much lower fat content than other foods, up to 30% less, so they can enjoy more of their dinner without you worrying about getting too big. It's also packed with all the fibre, proteins, and vitamins they need for a healthy, active lifestyle. Added calcium and a special DentalCare system also help to keep your pet's teeth and gums in great shape. Maize, chicken (>14%), wheat, sorghum, barley, dried beet pulp, poultry meal, dried whole egg, animal fat, chicken digest, brewer's dried yeast, potassium chloride, dicalcium phosphate, salt, sodium hexametaphosphate, fish oil, DL-Methionine, linseed. [for < 10 kg] Contains EC permitted antioxidant. [for >= 10 kg] Contains EC permitted antioxidant: tocopherols. Vitamin A:12000 IU, Vitamin D‡:750 IU, Vitamin E (à-tocopherol):200 mg, Copper as Copper II Sulphate:25 mg, L-Carnitine:40 mg, ß-carotene:1 mg. No colorants or preservatives added. Maize, wheat, chicken (>14%), sorghum, barley, dried beet pulp, poultry meal, dried whole egg, animal fat, chicken digest, brewer's dried yeast, potassium chloride, salt, sodium hexametaphosphate, dicalcium phosphate, fish oil, DL-Methionine, linseed, glucosamine hydrochloride, chondroitin sulphate. [for < 10 kg] Contains EC permitted antioxidant. [for >= 10 kg] Contains EC permitted antioxidant: tocopherols. For feeding guidelines, see feeding chart.